She was educated at Northwich, Camberwell and Central St Martins Colleges of Art studying printmaking, glass, architecture and fine art. She works from her studios in Norfolk and in the Cairngorms, where she is greatly inspired by the natural environment. Images are based on plant forms, especially seedheads seen against sea and sky. Influences also include the contrasting landscape and native plants of the Scottish Highlands. Angie has worked in a range of printmaking techniques including lithography, silkscreen, wood-engraving and etching. Recently she has concentrated on linocut and wood engraving. She prints small editions of rarely more than 35 onto Janapnese paper. Her motifs successfully transfer between media, from fine art printmaking to interior design fabrics. Her Dandelion One and Two fabric designs were included in the nominations for the Elle Decoration Design Awards 2006. 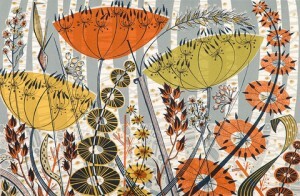 In 100% cotton, these screen-printed designs in a whimsical fifties style, have featured in many national publications. She has exhibited her work extremely successfully since 2002 and many of her print editions sell out very quickly.